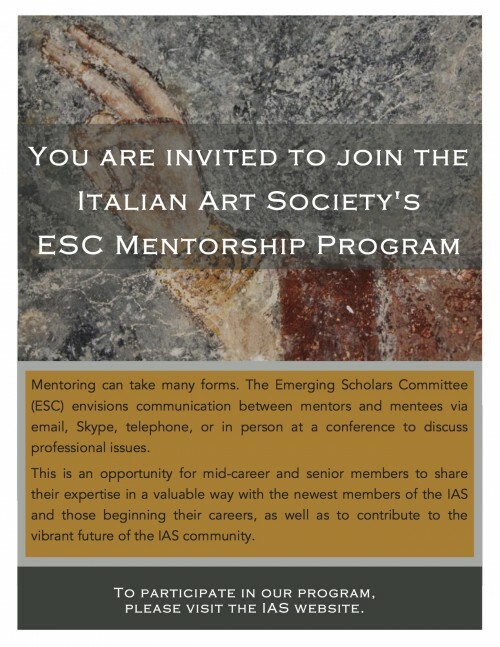 The Italian Art Society Emerging Scholars Committee (ESC) provides a supportive community for graduate students and recent graduates in Italian studies. We host a Google Group and a Facebook group to act as an information network for emerging scholars. Through them you can find calls for papers, fellowship opportunities, relevant current news stories, and other materials related to the study of Italian art and architecture. The Facebook group, in particular, facilitates contact among colleagues for advice on researching and living in Italy: on everything from working in archives to locating reliable and affordable housing and finding the best gelato. We also maintain a Twitter feed! The ESC manages a mentoring match program to enable emerging scholars to discuss their work with more advanced colleagues. Click here to sign up. All eligible IAS members are encouraged to join us and to post in both our Google and Facebook Groups. This includes anyone currently enrolled in a masters or doctoral program; anyone who has earned a master’s degree within the past six years, but who has not yet enrolled in a doctoral program; and anyone who has earned a PhD within the past six years. We welcome any questions or comments and look forward to working with you all as we develop our community. For more information, or to join the IAS ESC Google Group, contact Antje Gamble, ESC chair. Are you on Facebook? Join our Facebook group. Follow the ESC on Twitter. Click here to participate in our mentoring program.